Dennis Quaid is on the road to bachelorhood once again. His third wife, real estate agent Kimberly Buffington, filed for divorce on Friday morning. She wants half of their assets, but Quaid says no way. Dennis Quaid and his third wife, Kimberly Buffington, are no longer a couple. Kimberly filed for divorce this morning in Texas and TMZ reports the divorce will likely get very ugly based on Dennis’ response to her filing. TMZ obtained Kimberly’s petition which cites a very unhappy marriage as her reason for leaving Quaid. “The marriage has become insupportable because of discord or conflict of personalities… that destroys the legitimate ends of the marriage relationship and prevents any reasonable expectation of reconciliation.” Ouch. In Kimberly’s original filing for divorce, she asks Quaid for spousal support and attorney’s fees. But Quaid seems to be on the offense and plans to prevent Kimberly from getting any joint assets. While the temporary order gives Kimberly “possession of their main residence and the Mercedes,” TMZ says Quaid wants Kimberly to receive zero assets. No word yet on custody of their 4-year-old twins or child support. The couple made headlines back in 2007 when their twins, Thomas Boone and Zoe Grace, were given an accidental overdose of the drug heparin at Cedars-Sinai Medical Center in Los Angeles. The newborns received 10,000 units when only 10 units were prescribed. Confusion arose because the vials for the dramatically different doses were similarly labeled. The twins suffered severe internal injuries but thankfully recovered. Dennis and Kimberly Quaid sued Baxter Healthcare Corporation — the manufacturer of the drug — as well as Cedars-Sinai Medical Center. The Quaids reached a settlement of $750,000 with Cedars in 2010. Quaid’s first wife was P.J. Soles, a popular actress in the 1970s and 1980s. Soles and Quaid married in 1978 but divorced in 1983. Quaid’s third wife, Kimberly, was a real-estate agent out of Austin, Texas when the pair met. They wed in 2004. 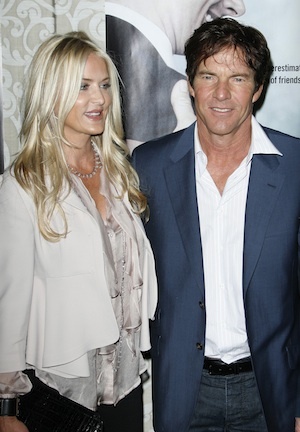 We will bring you more news about Dennis Quaid and Kimberly Buffington’s divorce as the proceedings unfold.